What a wonderful St. Patrick’s Day paddle! I kayaked Arbuckle Creek with a friend, Rick Murphy. (Rick paddled Fisheating Creek with me as well.) We paddled from the boat ramp in Avon Park on Arbuckle Road, north to Lake Arbuckle and then back, about five miles total. What a sweet river! I had read that it can get congested with vegetation in a couple spots when the water level is low, but we had no problems getting through. Arbuckle Creek is a 23-mile blackwater creek that runs from Lake Arbuckle in Avon south to Lake Istokpoga in Sebring. Arbuckle State Park fishing and campgrounds border parts of the upper river with the U.S Airforce Base (which we never saw from the river) along the east side of the river. My guidebooks describe the 2.5-mile stretch from the Avon Park boat ramp to Lake Arbuckle as the most scenic, so I called the Sebring Kayak Tours (the only outpost I could find in the area) and made arrangements to meet up with Nelson. There isn’t an outpost on this creek, and Nelson was nice enough drop two kayaks at the boat ramp, so we didn’t have to pick up the kayaks in Sebring. For the first two hours, we paddled north on the narrow creek, against a light current. It was a perfect day, sunny and warm but cool in the shade. Spring had sprung on the creek! The Cyprus, dressed once again in their greens (just in time for St. Patty’s), cast beautiful reflections on the water while cypress knees clustered like crowds of little people gathering for a parade. Oaks and red maples seemed to embrace the narrow, twisting creek, with a magical sense of a fairy tale. Lilies and irises were just beginning to bloom. When we reached Lake Arbuckle, we stretched and snacked on nuts and fruit and watched a silly sandhill crane family grassing. The trip back, a breeze now with the current, treated us to a new perspective of the creek with great herons lifting off from the bushes and lots of baby alligators. These alligators ranged from one to three feet long, and at one point, we passed through a pool where little eyes poked out of the water around us—perhaps eight or ten sets. We kept watch for momma gators, but never spotted any. The river had a lazy feel. We passed a few men fishing from the shore or from small, quiet boats and watched as one man pulled in a nice-sized catfish. Birds called to each other from the trees: ospreys, great herons, ibises, limpkins, great egrets, kingfishers, and hawks. Beautiful dragonflies and damselflies hitched rides on our yaks as we paddled. 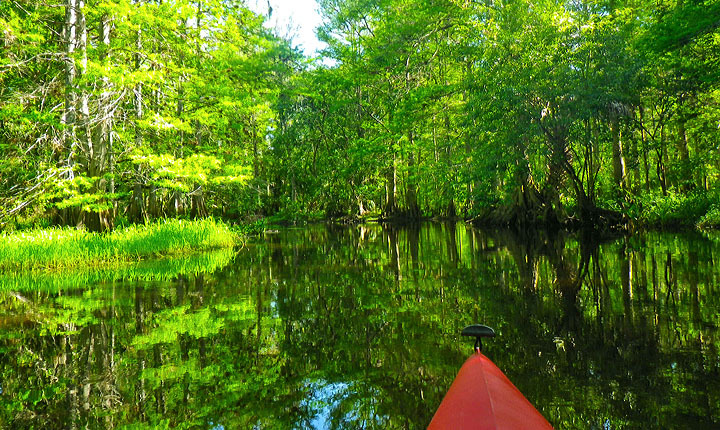 Arbuckle Creek made my list of “awe” some Florida waterways. It captured me from its first twist and turn with its mystical charm; it took my breath away! What a beautiful picture of the setting at Arbuckle Creek on St. Patrick’s Day in south central Florida ! The beauty of nature was amazing and breathtaking on this trip . Kayaking with Susan is always’s fun , informing and relaxing . She has a gift of describing the scenery and a talent of writing that is amazing . The only thing missing on this day was green beer on Arbuckle Creek ! Susan thanks for the privilege of sharing this awesome kayaking trip ! Thanks, Rick. It WAS an amazing paddle, wasn’t it? Yes…even the water mocassin snake trolling the launch area ! But the the bag treats you brought made our day !